Now we will investigate some specialized adaptations. 4. Specialized Appendages: fins, tentacles, claws, etc. 5. 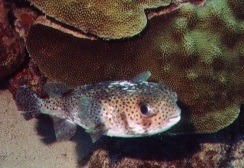 Symbiotic relationships in which both organisms benefit. 6. Scuba- Specialized equipment to adapt divers to the underwater environment. The Golden Stingray can change colors to blend in with its surroundings. 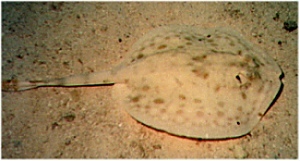 The Golden Ray is difficult to see on the sandy bottom. 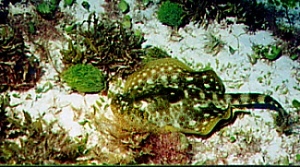 Many ocean organisms use camouflage to ambush prey or to hide from predators. Use the links to find another organism that uses camouflage. Draw or print out a picture and label the organism. 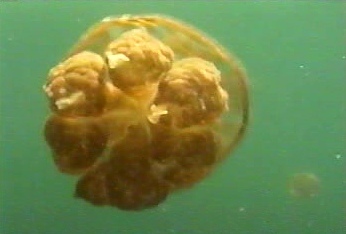 Jellyfish have tentacles that hang down from its bell. The tentacles contain stinging cells called nematocysts that stun or paralyze prey. Click on the picture to view the video. Use the links to find another organism that uses venom or stinging cells. Draw or print out a picture and label the organism. 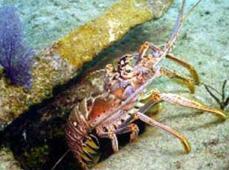 The Reef Lobster's hard shell protects it. when it is disturbed or frightened. Use the links to find another organism that uses armor to protect itself. Draw or print out a picture and label it. 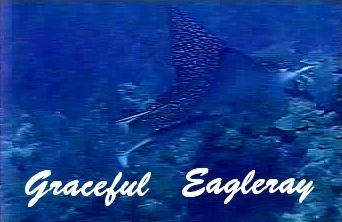 The graceful Eagle Ray has elongated fins that act like wings helping it to glide and "fly" through the water. In symbiotic relationships, each organism benefits from the other. The benefit can be protection from predators, the removal of parasites or diseased tissue or can be a source of food for one or both organisms. Try to identify how each organism benefits in the relationships below. When human beings explore the ocean environment, they need to add specialized equipment to be able to move and breathe underwater. Divers use several pieces of specialized equipment. A regulator and a tank of air allow the diver to breathe underwater. A mask helps the diver see clearly. Fins help the diver move more quickly and with less effort. A buoyancy control vest (along with a weight belt) help the diver control his/her depth. 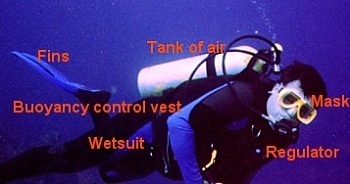 The diver can put air into or let air out of the vest. This allows the diver to hover or "float" at certain depths without sinking or going up. A wetsuit helps keep the diver warm by adding a layer of insulation. Now that you know about various adaptations you can design a new marine organism, a predator or a prey. 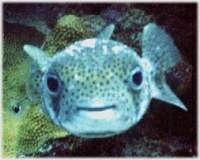 Give your organism specialized body parts or abilities that help it live in the coral reef. Create a model or a drawing of your organism.